Mucus stagnating in the nose can be the hotbed of numerous problems. Most importantly, it inhibits breathing. Nasal mucus can get superinfected the result of which may be most commonly the inflammation of the middle ear or the maxillary sinuses. By keeping the nasal passages clean, you can prevent numerous protracted illnesses and inconveniences. Which position should the child be in during the aspiration? Aspirate the nose of infants after laying them into a stable position and hold their head during the process. If the child is already able to sit, sit them in your lap. In this case, do not lay the child on their back during the aspiration. Why is Nosiboo different from all other nasal aspirators on the market? The most crucial element of Nosiboo products is the patented Colibri Head. The liquid cannot exit from the inside of the head, safely preventing the nasal mucus from getting into the connecting tube. That means you won’t have to purchase extra replaceable filters for the daily use of this device. After use, the patented Colibri head is the only part of the device that needs to be cleaned and it can be done within a minute. The Colibri Head can be powered in two different ways: as a part of the electric Nosiboo Pro, and also with the human-powered nasal aspirator. On top, the electric device is adjustable according to the baby's age and has a child-friendly design. Are the Nosiboo products safe for infants? Yes, we have designed our products to be safe for babies. Till what age can the Nosiboo products be used? The use of the electric Nosiboo Pro is recommended till the age of 6 while the use of the Nosiboo Nasal Aspirator till the age of 4. The application may depend on the thickness of the secretion or the child’s ability to blow his nose on his own. How often should the Nosiboo products be used? You may use the products as often as needed although you should stop using the products if there is no mucus in the Colibri head. Please consult your healthcare provider about when and how often you should clear your baby’s nose. For more information please see the user manuals. Can the use of Nosiboo products cause allergic problems? We exclusively use materials that are absolutely harmless to humans. The Colibri head’s nose tip is made of soft, BPA-free silicone to make sure that it does not irritate the baby’s nose. Do I need to use a filter for the human-powered Nosiboo Nasal Aspirator? There is no need for a filter! Thanks to the Colibri head's exclusive patented design, the liquid cannot exit from the inside of the head, safely preventing the nasal mucus from getting into the connecting tube or into the mouth of the person performing the suction. How strong is the suction power of the Nosiboo Pro Nasal Aspirator? 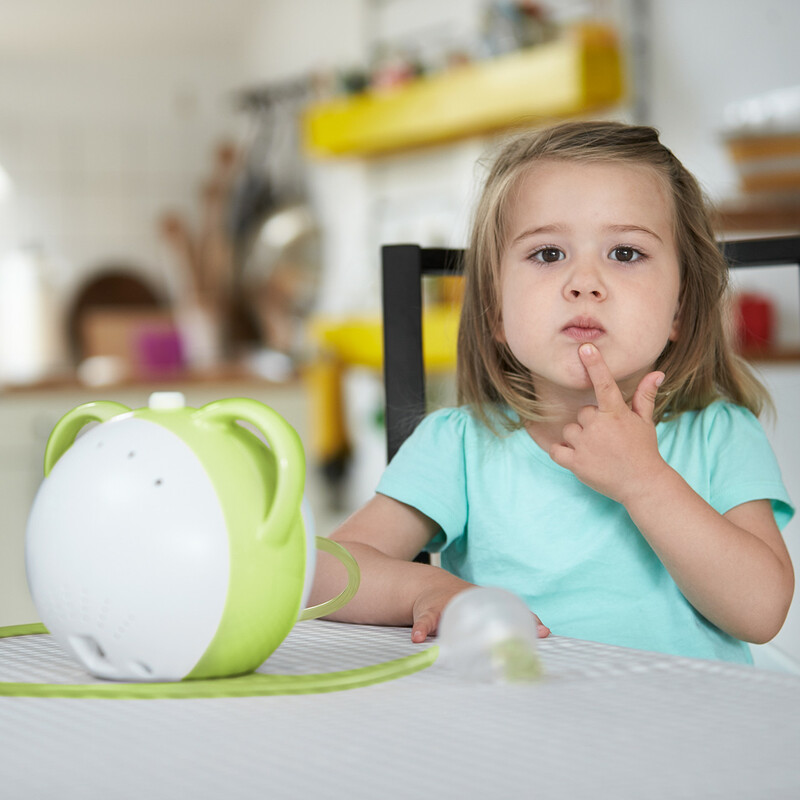 Can the suction power of the Nosiboo Pro Nasal Aspirator be adjusted? Yes. 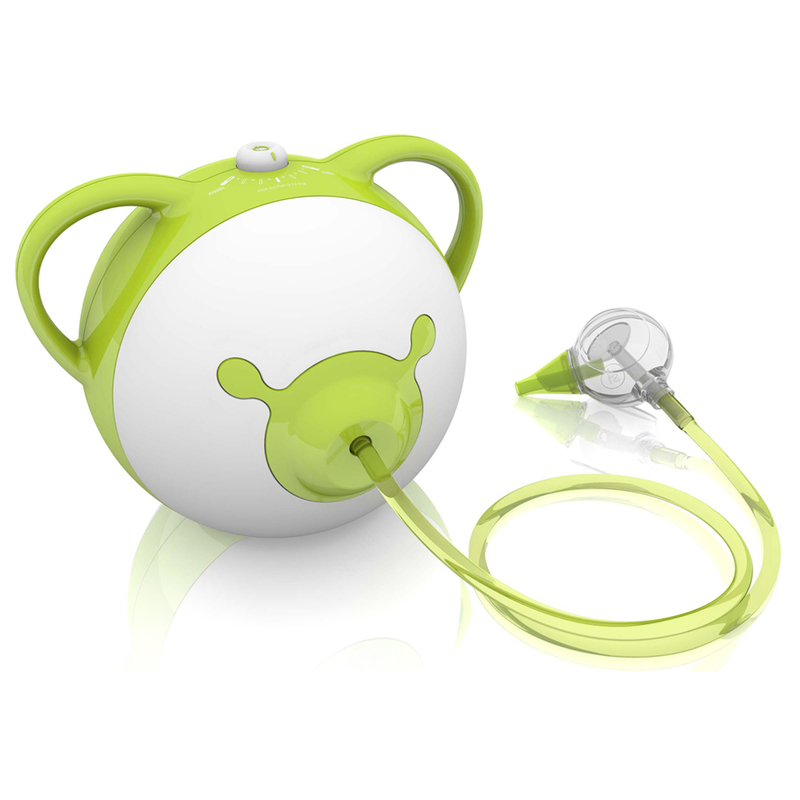 The suction power can be adjusted to fit the age of the child and the thickness of the mucus. What to do if the Nosiboo Pro Nasal Aspirator has turned off? The device turns itself off automatically after 15 minutes of continuous use but it can be restarted. In case of overuse or if insufficient ventilation is provided, the thermal switch switches off the device and will prevent reuse for approx. 45 minutes for safety reasons. How can the Nosiboo products be cleaned? The patented Colibri head is the only part of the device that needs to be cleaned after a nose cleaning session. It can be taken apart and simply washed under running water. Wipe the connecting tube with a cloth if necessary. How can I replace lost spare parts for my Nosiboo Pro? We created the Nosiboo Pro Accessory Set for such cases. This accessory set is designed to be used exclusively with the Nosiboo Pro Nasal Aspirator. It is ideal for families with more children and is optimal if you have to replace a lost part. The Nosiboo Pro Accessory Set includes:1 Colibri head, 2 nose tips,1 connecting tube,1 air mesh. What is the Nosiboo Pro Nasal Aspirator’s air mesh for? There is a special air mesh behind the Nosiboo Pro’s tube connector which prevents solid objects and dust from entering the housing. Where can I buy Nosiboo products?